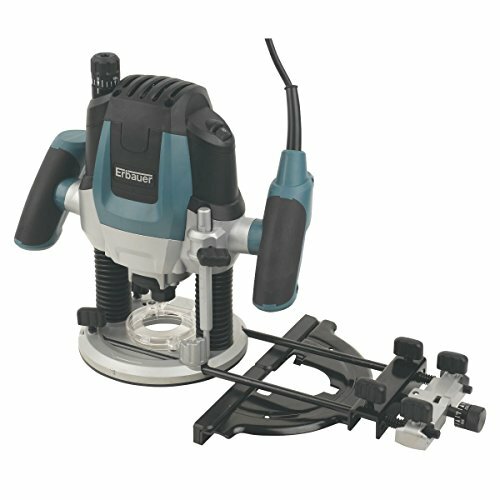 Powerful router and collet with pre-set plunge depth stop and fine-depth adjustment for easy, precise cutting and shaping of different materials. Supplied with accessories, 3 router bits and carry case. Product contents:ERB380ROU, parallel guide, spanner, dust adaptor, centring pin with ring screw, 2 x guide bushes (16 and 30mm), 3 x router bits (straight, v-groove and round), router mat and carry case. Specifications:Max. plunge stroke 50mm. No load speed 11,500-28,000rpm. Weight 9kg. Spindle Lock. Soft-Grip Handle.